According to Brand Finance, in its report Global 500 2019, a brand should attract custom, build loyalty, motivate staff and make money. After all, huge investments are made in brand design, launch, and ongoing promotion. Considering the potential financial value of a strong and successful brand, like Amazon, this makes sense. In fact, per Brand Finance, Amazon maintains its title as the world’s most valuable brand. Growing in the last year by nearly 25 percent, to an inspiring $187.9 billion; over $30 billion more than Apple in 2nd place. 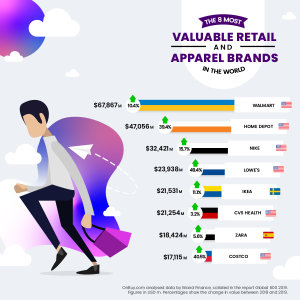 Interested in exploring brand value in added detail, British marketplace OnBuy.com analyzed the Global 500 report to discover the eight most valuable retail and apparel brands in the world 2019. OnBuy found the United States is hugely successful in retail and apparel, holding 6 of the 8 highest brand values, 2019. In number one place is Walmart, with a brand value of $67,867 million — 10.4 percent change over 2018. This is closely followed by Home Depot ($47,056 million; a 39.4 percent change over 2018), apparel brand Nike ($32,421 million; a 15.7 percent change over 2018) and Lowe’s, with a brand value of $23,938 and a change of 49.4 percent over 2018. Outside of the United States, Sweden’s Ikea and Spain’s Zara lead with high brand values, worth $21,531 million and 18,424 million pounds, respectively. Other American brands CVS Health ($21,254 million; a 3.2 percent change over 2018) and Costco ($17,115 million; a remarkable 50.5 percent change over 2018) land in 6th and 8th place, to complete the top 8. *Brand Value is defined as: the value of the trade mark and associated marketing IP within the branded business.